Lisa, Ben and I met for lunch today. Nothing unusual there. We usually like to do this a few times over the summer when we can. What was surprising was Ben ordered his own lunch. The waitress asked what we wanted and, before Lisa or I could say anything, he piped right up that he wanted chicken fingers and squash casserole. It was a cool growing up moment that I was glad Lisa and I got to share. It has been a crazy couple weeks for the Heinz household. I don't think I'll even try to recap all the shuffling around. There were days of three kids, two kids, one kid, and even a few days of no kids. It was quite an adventure. Lisa attended Football 101 for Women at UGA last Friday. She has been going now for the past four or five years and loves it. It's basically a day to get out to Athens, meet the coaches, learn about what the players do, and get to participate in some of it. Usually, Lisa goes with her sister. Unfortunately, she wasn't able to make it this year since one of the twins got sick. On the bright side our friend Rachel was able to step in at the last minute. I think they ended up having a really good time. This week starts Ben's second round of swimming lessons. He's on his own with the other kids and the teacher this time. It's really a bit odd not being in the pool to help him but he did great last night. I think he'd swim for days if we let him. Keeping his water bravery a bit in check at the beach this summer may get interesting. It's time for the twins to visit. So, while we are all having fun it is also a good bit of work (especially for Lisa while I'm working). Anyway, that's about it for the moment. More to come this summer. Sunday started out much as Saturday had. The previous evening I had enjoyed a nice dinner at the Garden Route Game Lodge and then just relaxed enjoyed the extremely clear African sky. When I woke up in the morning I joined a number of other guests at the Land Rovers to begin our morning tour of the ranch. 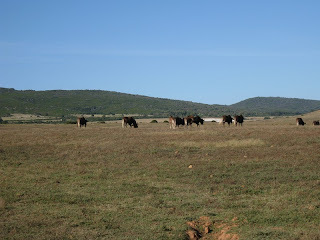 The terrain at this ranch was much more open and we were afforded a greater opportunity to see the animals there. 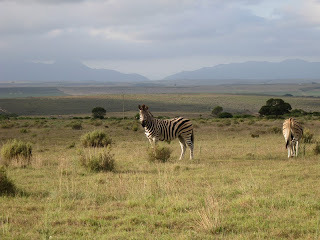 We saw lions, rhino, giraffe, wildebeest, springbok, elephant and others. Here are a few pictures from the tour. 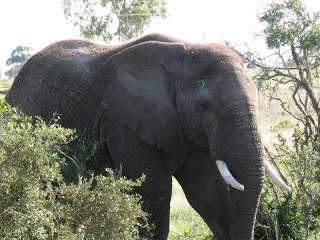 Once again I departed the game ranch shortly after our return from the game drive and breakfast. I was on the road by 10:30 am or so on Sunday. 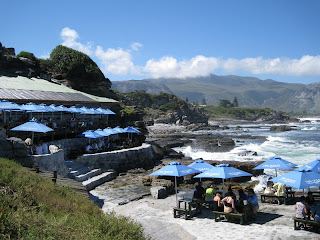 The plan was to gradually make my way back to Cape Town along the coastal highway with a stop off in Hermanus for lunch. Along the way I took this picture of the countryside. 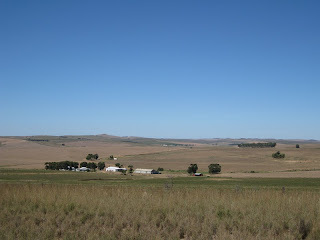 The terrain to the south along the Garden Route looks a lot like my home state of North Dakota. Thought it was very interesting. About 1 pm I made it to Hermanus by following the N2 and the R326. 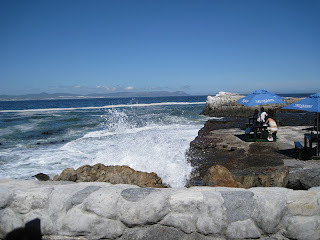 Hermanus is a big whale watching town. 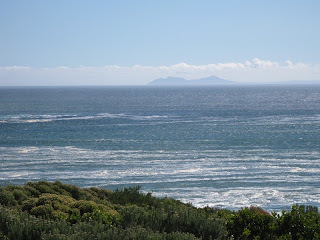 In the winter many whales come and play in the bay and it attracts a lot of tourists. Since it was off season the town wasn't too packed and I was able to enjoy a nice lunch at this place called Two Oceans. It is setup right on the rocks by the Indian Ocean. Really a great setting and perfect weather. 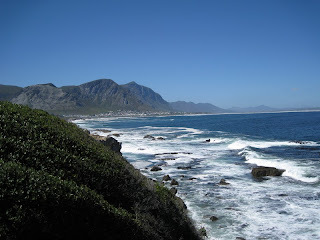 After lunch I left Hermanus and drove along the coastal highway (R43/44) for a few hours back to Cape Town. The views from the highway were really spectacular. That pretty much ends my South African odyssey. I won't bother going in to the return flight back to the states. Suffice to say it was brutal. Still, well worth it overall. I had a good work experience getting to know some new people and also had a great time getting to see a bit of the country. 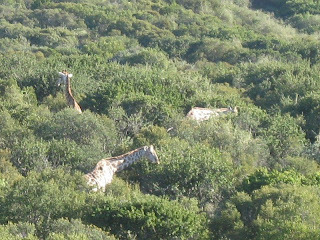 Saturday morning I awoke and joined a number of other guests on the Land Rovers to go touring the reserve and see what animals we could see. We left the lodge area around 7 am and drove out. There were three Land Rovers going out. Each had a guide and eight or nine guests. Once out past the lodge we split apart and each group went their separate ways. 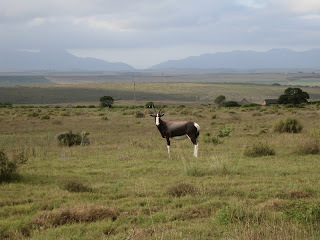 The brush at Buffelsdrift is very thick so it is hard to see a lot of animals or very far on the landscape but it was very fun to get out and experience the countryside. 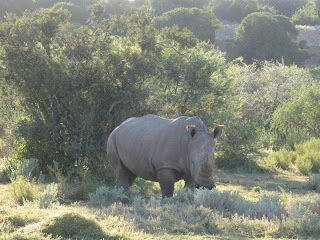 We did run across some white rhinos and a number of giraffes. The driving tour was a just over two hours then we returned to the lodge for breakfast by the lake. By that time it was near time for me to check out and be on my way. After leaving Buffelsdrift I drove just a bit further north of Oudtshoorn to the Cango Caves. These are some truly amazing limestone caves that have been carved over the years. Not very much of the cave network is open to the public but they do offer a couple different tours. I just took in the standard tour rather than the adventure tour. The adventure tour requires some caving and working your way through tight cracks and such. On the standard tour you just walk through the caverns about 550 meters in to the mountain. They believe the whole network runs well over 5 kilometers. The pictures I took in the cave with it's lighting weren't that great so I'll let you look those up elsewhere. Really striking though. 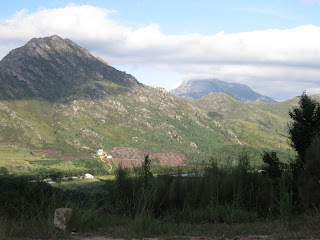 I spent a couple hours up at the Cango Caves area then started heading back to Oudtshoorn. 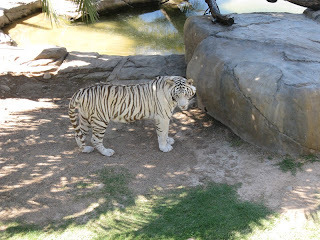 Along the way there is a semi-zoo like park called the Cango Wildlife Ranch. It is slightly cheesy but, more importantly, it is a cheetah rehabilitation facility. I guess it could most closely be related as SeaWorld for cats. 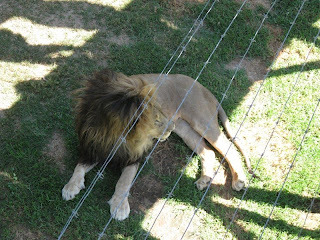 Anyway, they have a lot of rare cats, birds and alligators there. You can even pay a bit extra to go in a pet some of the cheetahs or go cage diving in an alligator pond. I didn't do either. 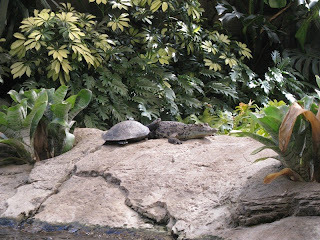 Thought this was a funny shot of a turtle resting on an alligator. 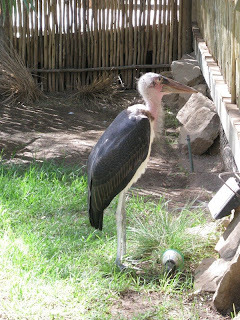 I'm sorry but if you ever get up close to a stork, they are ugly. Why would we say they bring babies? 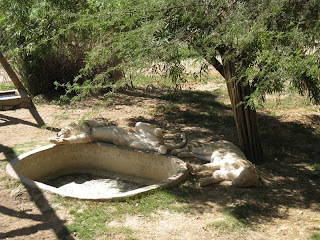 These are a pair of white lions. From what they told us there are less than 500 left. So, as if all that wasn't enough for one day I then had to drive south to get on what they call the Garden Route. 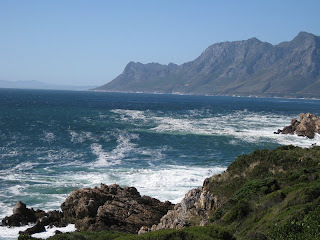 It's basically a beautiful scenic drive through the coastal region of South Africa. To get there from Oudtshoorn you can go really two main ways. You can take either the N12 to George or the R328 to Mossel Bay. Both routes take you through some beautiful mountain country. 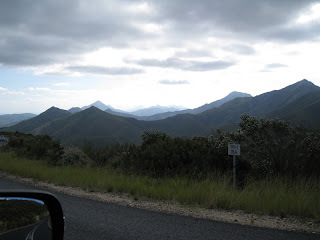 Most people end up taking the N12 to George and drive the popular Outiniqua Pass in the mountains. Francois suggested the Robinson Pass along the R328 was actually more striking. So, I ended up taking that route down to pick up the N2 near Mossel Bay. After picking up the N2 in Mossel Bay I drove on for a while before finally stopping at my destination for the Saturday night - the Garden Route Game Lodge. 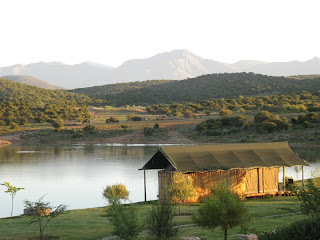 It is located on the N2 just outside Albertinia. I was able to get everything wrapped up with the client by mid-day on Friday. So, I took the afternoon off an headed out of town. As I mentioned, Francois setup a really great driving trip that took me in to the middle of South Africa. I was able to see some fantastic country during the drive. If you're following along on a map my route took me out of Cape Town along the N1 then a turn on to the R60/62 at Worchester. 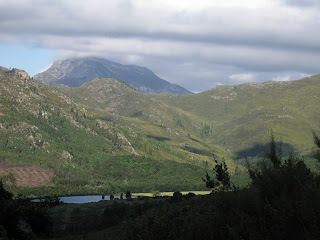 I followed this route through Ashton, Montagu, Barrydale, and Ladismith. 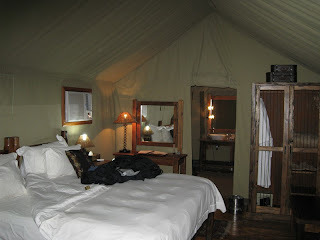 My final stop for the evening was in Oudtshoorn at the Buffelsdrift Game Lodge. 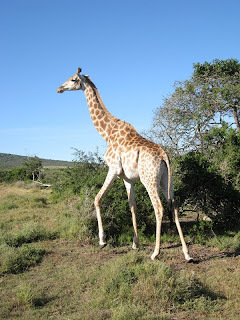 Buffelsdrift game lodge is a private reserve which has a semi-resort atmosphere while also having a number of exotic animals. You stay in tents but they aren't really "tents" in the traditional sense. More like houses with canvas walls. Running water, electricity, tubs, showers, etc. Here are some pictures from my evening there. It's been a while since I posted on the South Africa trip. Sorry about that. Been busy getting back home and caught up with family, friends and work. I'll add a few posts about my weekend travels in the near future. Anyway, it is very nice to be back home with Lisa and Ben. Thought it might be fun to add a link to the countries and states Lisa and I have visited together. So far, we are at 6 countries, including the US, and 11 states.